Fortunately, this was the only surprise in the results. 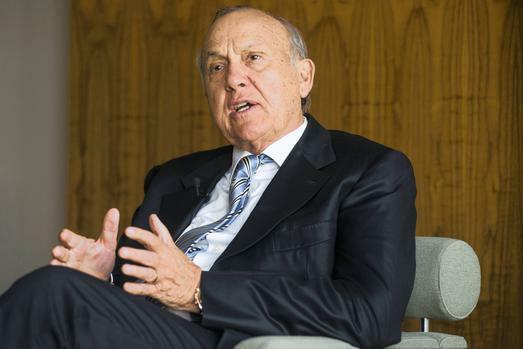 After some 50 years of shaping, moulding and influencing the strategic direction of retail giant Shoprite, Christo Wiese is to sell his voting rights, held as deferred shares, back to the company. The shares form part of a two-tier capital structure long disliked by shareholders, where ordinary shares exist alongside deferred shares. However, the deferred shares, which carry 32.3% of the voting rights of Shoprite, are ringfenced and held by Thibault Square Financial Services, Wiese’s investment business. The move to simplify the control structure has been cautiously welcomed by investors, but much hinges on the price to be paid. While Shoprite’s memorandum of incorporation lists the value of the shares at 0.1 cents per share, putting the value at just above R30 000, the reality is likely to be somewhat different. As the value of these shares is not directly related to the Shoprite share price, shareholders will want to understand how the price is calculated. While this move came as a surprise to shareholders, it was, fortunately, the only surprise for shareholders who were bracing themselves for more bad news following the shocking trading update in January. The numbers were torrid as warned, and Engelbrecht went to some length to explain how these arose. He accepted responsibility for Shoprite’s own goals and insisted that the results would not be repeated in the second half of the year. “Our first-half performance is below expectations, but not a reflection of the fundamental strength of the business,” Englebrecht says. The retailer was impacted by currency devaluations in its core African markets of Angola, Nigeria and Zambia. Hyperinflation in Angola saw margins fall by 0.8%, causing a R552 million profit to turn into a R62 million loss. The supply chain disruption caused by industrial action at the Centurion Distribution Centre last May and June lasted longer than anticipated. At the same time, more than half of the business went live on the new SAP IT system, compounding stock-out woes. The result was that an estimated 2% of sales growth was lost, equivalent to R1 billion in turnover and R250 million in profit. 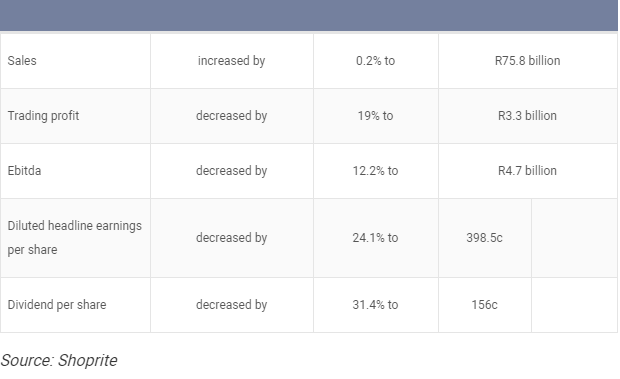 These issues coincided with the longest period of stagnant inflation in a decade. “We have never had 18 months of consecutive deflation in the history of this business,” says Engelbrecht. As a result of the above Shoprite lost some market share. What is noteworthy though, is that the retailer did not take the easy route and raise prices to stem the losses. “It is critical that Shoprite uses its scale and bargaining power to keep its prices lower,” says Hertzog. Strategic decisions to invest in convenience foods, fresh foods, private label and liquor have paid off, and the positive sales trend emerging from the festive season has continued in January and February alongside improving product availability. While Africa’s currency woes saw sales decline by 13.3% to R11.1 billion (14.7% of turnover) in the half, Engelbrecht remains bullish on Africa’s long term potential. Story originally appeared on Moneyweb.